Ragon Institute Director Dr. Bruce Walker attended the event along with Massachusetts General Hospital President Dr. Peter Slavin , Senior VP for Research, Dr. Harry Orf, and Dr. Marylyn Addo, Director of International Programs for the Ragon Institute. 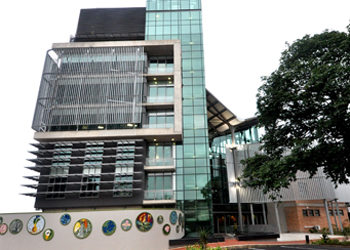 On October 9, the new facility for the KwaZulu Natal Research Institute for TB and HIV (K-RITH) opened in Durban, South Africa. The $40 million building, funded by the Howard Hughes Medical Institute (HHMI), will house scientists, researchers, and administrative staff to advance the critical mission of the center to research HIV and TB at the heart of the epidemic. The ultimate goal of K-RITH is to serve as a center of scientific research excellence in the center of the worst convergence of the TB and HIV epidemics in South Africa, and through this to focus research efforts toward rapid translation for the betterment of human health. The new K-RITH faciility in Durban, South Africa. “After all our efforts in South Africa over so many years, to see the completed building in all its glory, and realize the impact it will have, was simply breathtaking.” said Dr. Walker. Walker together with Drs. Salim Abdool-Karim (UKZN), Willem Sturm (UKZN) and Bill Jacobs (Albert Einstein School of Medicine) served as the initial steering committee guiding the formation of the institute. Distinguished guests at the event included South Africa Minister of Health, Dr. Pakishe Aaron Notsoaledi and the Premier of KwaZulu-Natal Province, ZweliMkhise. Other notables who travelled from the US for the event were Director of the National Institutes of Health, Tony Fauci; President of HHMI, Dr. Robert Tjian; Nobel Laureates Dr. David Baltimore and Dr. Peter Agre; Dean of Albert Einstein College of Medicine, Dr. Allen Spiegel; President of Johns Hopkins, Dr. Ronald Daniels; President of IBM-Africa, Dr. Gary Cohen, and Director of Barloworld, South Africa, Isaac Shongwe. Other guests at the event included many of the top scientists from Southern Africa and leading business leaders, as well as members of the press. Massachusetts General Hospital has been supportive of HIV research in South Africa, having played a key role in procuring funding for establishment of the Doris Duke Medical Research Institute (DDMRI), which forms part of the new K-RITH facility. During a toast at a dinner prior to the event, MGH President Dr. Peter Slavin announced the establishment of 100 travel scholarships to K-RITH, CAPRISA and HPP, each for $2000, to allow Durban to connect with students and faculty from other African universities. 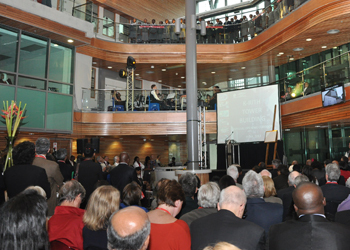 Opening ceremony of the new K-RITH building.